About the CouncilThe Gulf of Maine Council on the Marine Environment is a Canadian-American Partnership of government agencies, non-government organizations, and business interests. The Council’s mission is to maintain and enhance environmental quality in the Gulf of Maine and to allow for sustainable resource use by existing and future generations. 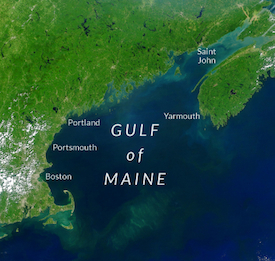 The Gulf of Maine is bounded by Nova Scotia, New Brunswick, Maine, New Hampshire, and Massachusetts. A vital role of the Council is to serve as a forum to exchange information, innovative ideas, and lessons learned. It leverages regional skills and expertise, thus making more rapid progress in improving the stewardship of the Gulf’s resources. It organizes conferences and workshops on priority issues; conducts integrated environmental monitoring and data synthesis; performs policy analyses; provides grants and awards; accelerates the transfer of science to management via internet-based tools and other mechanisms; raises awareness about the Gulf; and connects people, organizations, data, and information in the region. 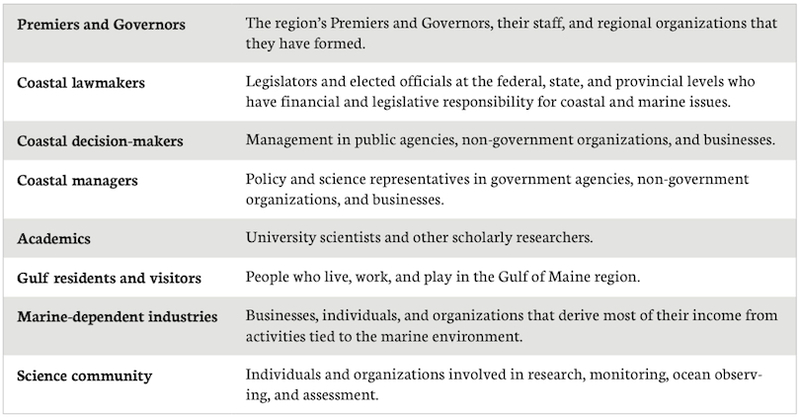 Gulf of Maine Councilors are leaders of state, provincial, and federal agencies; non-government organizations; and the private sector. The Gulf of Maine Council fosters consensus-based decision-making and collaboration among a wide range of parties with an interest in the Gulf. Its meetings are open to the public, and its five-year action plans incorporate diverse public input. Representatives of government agencies, academia, businesses, and non-government organizations participate in the Council’s committees. On an annual rotating basis, one of the five states and provinces serves as the Secretariat and coordinates the Council’s work. Contract staff located around the region work with the Council and its committees to help accomplish its goals, and non-profit associations support the Council in both Canada and the United States. Four principles guide the Council and participating agencies in their decisions involving the Gulf of Maine ecosystem. These principles are congruent with international protocols, as well as state, provincial, and national legislation in Canada and the United States. The Council supports collaborative management that integrates economic, social, and ecological values and objectives, emphasizing natural rather than political boundaries. The Council supports conservation of the coastal and marine environment, and urges its members to proceed with caution to avoid environmental degradation. The Council is committed to a participatory process that informs and engages the public in setting priorities. In 1989, the Governors of Massachusetts, New Hampshire, and Maine, and the Premiers of New Brunswick and Nova Scotia established the Gulf of Maine Council on the Marine Environment for three purposes. To enable the region’s governments to be more effective stewards: By working together in a regional forum, state, provincial, and federal agencies learn from each other, try new approaches, and as a result are better stewards of the resources for which they are legally responsible. To sustain strong partnerships: The Council works to be an effective partner and build the capacity of local and regional organizations that are addressing issues of regional concern. To integrate watershed, coastal, and ocean management: The Council fosters an ecosystem-based management approach. It works to ensure that decision-makers possess the necessary information to manage human effects on the ecosystem, to preserve ecological integrity, and to sustain economically and socially healthy human communities. As a transboundary organization, the Council is uniquely positioned to focus on issues that require or benefit significantly from regional collaboration. The Council’s work often involves collaboration at municipal, state, provincial, national, and bi-national levels. While the Council does not have direct regulatory or policy-making authority of its own, its goals and outcomes are congruent with state, provincial, and federal priorities. The Council promotes progress toward common goals. The Council’s work focuses on complex natural and socioeconomic systems, making it a challenge to attribute particular outcomes to the organization’s efforts. However, the Council knows that assessing results is essential for continued success. A strength of the Council is that it is a coalition of people from many groups. However, this organizational structure can result in the Council’s role being camouflaged, as initiatives may occur under the banners of member and partner organizations. The Council will report on regional progress toward the goals in this Action Plan. This recognition will identify the lead organizations, including direct activities of the Council, its partners, and the work of others. The Council was formed in recognition of the need for natural resource and socioeconomic management spanning political and bureaucratic boundaries. 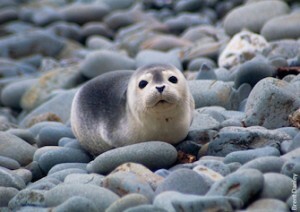 Building on its past accomplishments, the Council will continue supporting region-wide information gathering and sharing (e.g., seafloor mapping, environmental monitoring, science translation to management, indicators, state-of-the-environment reporting), public outreach and education, habitat restoration, and addressing key science and policy gaps. The Council will continue to foster innovative approaches to sharing information and enhancing collaboration. By working together in a regional forum, the states, provinces, and federal agencies learn from each other, try new approaches, and coordinate their efforts. As a result, they become better stewards of the resources for which they are responsible. The Council will continue to nurture strong partnerships among local, regional, and national organizations that are responsive to issues of regional concern. Wherever appropriate, the Council will participate and assist these groups, often seeking to build their capacity by creating strategic alliances.